BECOME PART OF THE STAMPIN’ UP! FAMILY! I went to my first Stampin’ Up! workshop nearly 12 years ago. When I first saw the Stampin’ Up! products I fell in love. Do you know that feeling? I loved all the colours and how they co-ordinated, I loved the range of products and I could see how they gave such a “professional” finish to my projects. But I so couldn’t afford them. When I discovered I could get a discount and I could even earn some money if I wanted to then I couldn’t let the opportunity slip by. I joined Stampin’ Up!. 10 years later I am still loving the products and still amazed at what you can do with paper and ink. What I didn’t know when I joined was that I became part of this big, global family that inspires each other and encourages each other to achieve their dreams whatever they are. I made friends with people from all over the world all sharing in this fun, creative journey. I know that you love the Stampin’ Up! products. You can be part of this family too and did you know that you can get a discount on your own purchases? It’s Sale-A-Bration time now and you can get LOTS of extra free products when you join Stampin’ Up! I wanted to stop by and tell you about it. During Sale-A-Bration there are some added bonuses when you join – including a Tote Bag. You have 2 Options (but only while supplies last). Choose Option 1 – Pay $169 and get $315 of products. That is $146 of free products. WOW! Choose Option 2 – Pay $210 and get $315 of products including the exclusive Tote Bag (valued at $87) You are only paying $41 for the Tote Bag. ** The Tote Bag is only while supplies last so get in early to choose this option. I know you might have some questions. What do I need to submit each quarter, can I drop anytime, What am I signing myself up to? If you are unsure ask me or check this FAQ form ->Download it HERE. whether you want to build your own business. The choice is yours. SO THE QUESTION IS THIS? Do you want to order and pay full price as a customer? or to join and grab a minimum 20% discount each time? Is that even a question?? You may not want to become a business demonstrator, but maybe you are one who would love to take advantage of the Demonstrator discount available each time you order. Whether you stay a long time or a short time, you are guaranteed a great time. Come and be a part of my JEN’s INK team. I am here to help you every step of the way wherever you are in Australia. Ask me for a free no-obligation information pack or chat to me about it soon. I would love to welcome you to my JEN’s INK Team. OR you can join straight away at my website -> HERE. I look forward to welcoming you to my team. SNOWFLAKE SHOWCASE WEEK – DAY 5 + 12 WEEKS OF CHRISTMAS WEEK 6. WHAT A TREAT! Two in One for you today. It’s Friday which means I have a special project for you for our 12 Weeks of Christmas series. And since it is the end of our Snowflake Showcase Week let’s use snowflakes for this project. I do hope you like this. I wanted to create a special Christmas Gift Tag/Ornament using the Snowflakes but keeping it simple so you can easily create a few of them. Cut the large snowflake from the Snowfall Thinlits from White Velvet Paper. Cut the next size down snowflake from Silver Glimmer Paper, the next size down from Tranquil Tide and one of the smaller ones from White Velvet Paper. Layer them and adhere them together. I used the Multipurpose Adhesive for that. Cut two medium size circle from the Layering Circles Framelits from Tranquil Tide card. Adhere the snowflake on to the front of the one of the circles. Loop a length of the Silver Metallic Edge Ribbon adhere behind the Tranquil Tide Circle. Adhere the 2nd circle behind that so the ribbon is sandwiched between the circles. That last circle behind is optional but I think it gives a neater finish so you don’t see the ribbon at the back. Have you liked these projects with the Snowflake Showcase?? Are these products something you would buy? I did say a Week of projects. Well … I am off to Stampin’ Up! Onstage this weekend. SO, I am going to give you a bonus project tomorrow with these products to keep you going all weekend. I will be back next week to tell you what I can. I am so excited to be off to Melbourne. If you are in Australia you can join with me in my JEN’s INK team. I have lots of hobby demonstrators if you just want the discount for yourself OR maybe you would like to get a little income and have some friends/family or new customers purchase from you. There is no hard selling as everyone loves the products. I show you the steps and help you whatever you want to achieve. You can stop by my page at the top to ‘JOIN THE JEN’s INK TEAM’ and find out more. Be sure to come back tomorrow for the bonus project. Until 31st December there is the option for the Ready, Set, Starter Kit. All ready to go with set products PLUS a $50 credit voucher to use in the first month, Plus a Stampin’ Up! apron and a collapsible bin. All this for $169. NB: -There is still the customizable Starter Kit available to create your own choice but this doesn’t include the additional options. – The Ready, Set, Starter Kit is only available in the South Pacific Market. WHY WOULD YOU WANT THE STARTER KIT ANYWAY? – You will get a minimum 20% off all your orders once you join. – See the products before anyone else sees them or has access to them. – Access to a quarterly Stampin’ Up! magazine full of inspiration. – Access to an exclusive Demonstrator Facebook group and website. – Opportunity to attend Demonstrator only events. – You will have me to support you whether you choose to build a business or enjoy your hobby and get the discount all the way. ** I am ready to go NOW -> Head straight HERE to my Website. I look forward to welcoming you to my JEN’s INK Team. LAST DAY FOR FREE INK AND PAPER! Ok. Tomorrow is the last day of July which is the last day of the awesome promotions running this month. There are a lot to take in I know. If you would like to order any of these then contact me directly or head to my store. I’ve talked about this before and you have probably read about it around the place but really, this is awesome value! 10 Free inkpads from any of the Colour Collections for Free. $117 in Value! On top of the $66 of free products in the kit that you get. The deal – Pay $169 and get $235 of products, pay no shipping and then choose the inkpad collection you would like. It is that easy. OK, but I sense a little hesitation, perhaps a little fear?? What would you be signing yourself up for? I will tell you straight. You are welcomed to the Stampin’ Up! family and if with me to my wonderful JEN’s INK team. Yes, they are all wonderful and many of them are a part of Stampin’ Up! to enjoy the discount – Yes, a minimum 20% off your orders. They don’t want to do parties or workshops. They support their hobby. Some of them might have a friend or 2 that orders from them. And that is OK. If you want to sell that’s OK too. You stay as long as you want. If you want to stay active as a Demonstrator you are required to submit $460 orders in per quarter. And that won’t be due now until the end of September being the first full quarter. If you don’t fill the quota you can drop and keep all your lovely inks and other products. You receive the new catalogues weeks before they are released and even pick up some free products along the way. Then there is the fun training events held often. If you have any more questions, please don’t hesitate to comment or email me at jghayward@yahoo.com. Otherwise, get your order together and head to my website now -> HERE to join the wonderful JEN’s INK team. Just scroll down a little on that page and click on the green tab. I look forward to welcoming you to my team. No matter where you are in Australia. FREE INK AND FREE PAPER!! Really! This is so awesome I have to tell you. Free Ink and Free Paper this month. I will give you the deets. FREE INK WHEN YOU JOIN! So you pay $169 but get $235 of products for that. (=$66 free products) + $0 Shipping + $117 Free Inkpad Collection =$183 of Free products. (Did you see that? You get more free stuff than you actually pay). I am sure you have more than $169 on your Wish List. Right? Be a part of the family she says! What does that really mean though? 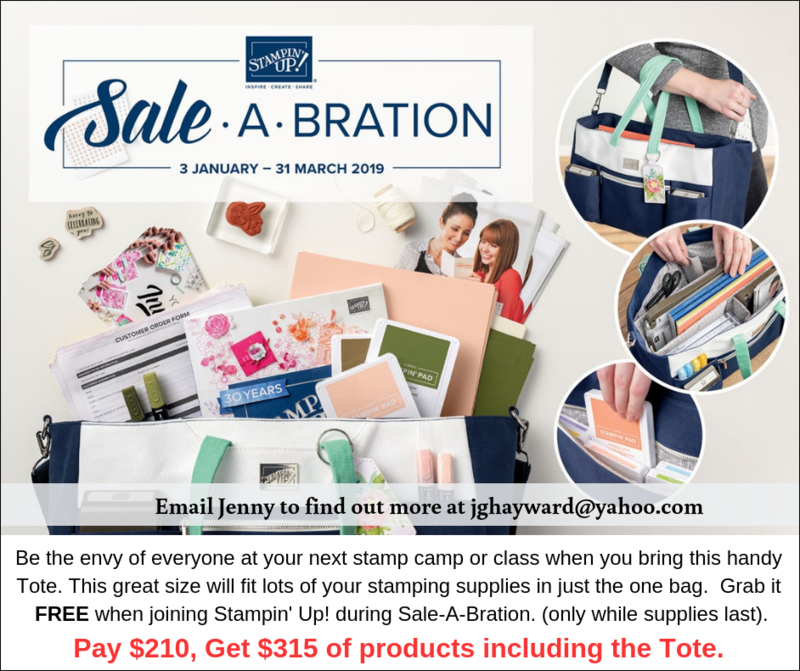 Be a part of the Stampin’ Up! family and be a Demonstrator and that doesn’t mean you have to do parties and demonstrate making cards. You can just enjoy getting your discount on your orders. If you are not sure, then head to my page -> HERE and see 10 Reasons why you would want to be part of the Stampin’ Up! family. Buy 3 of these select packs of paper and choose one for Free. How awesome! If you want a closer look at the papers ,check out p188-191 of the catalogue. CELEBRATING 9 YEARS WITH STAMPIN’ UP! 9 years ago today I joined Stampin’ Up! I really can’t believe it! I thought I would share my journey in discovering Stampin’ Up! all those years ago. I hope you don’t mind. I remember that first workshop I went to. All I knew of stamping was messy kids stamps but I went because I was just starting to make cards. Well! I was so impressed! It was all so beautiful, the colours, the stamps, oh! and the heat embossing. So magic! I was hooked. I remembered feeling so overwhelmed though. Where do you start? So I bought the stamp set we used Seeing Spots and some card and ink. When I got it though I had no idea what to do. It sat for a while on my desk. There was no Pinterest then and I didn’t know about Google searching. I was not tech savvy to search too much for that. I eventually had a go with the products – with interesting results. Today in celebration I thought I would share my cards with you. I think we know each other well enough now for me to put myself out there and to give you a little chuckle. I used my Seeing Spots set. The white card has the spots heat embossed I think. I added a few little extra embellishments that I had. Haha! I think I have improved over the time. I hope so anyway?? It took 18 months before I actually joined Stampin’ Up! though after that first workshop. My husband was diagnosed with Cancer and life changed. Thankfully after treatment he made a full recovery. Then I joined Stampin’ Up! and began my creative journey. I have met some amazing people along the way and many have become good friends. I love that Stampin’ Up! has brought us together whether they are fellow demonstrators or customers. Also I love that I have made friends near and far. I think I now have friends in nearly every continent of the world. How exciting and richer my life has become. I started this blog not long after I joined. I had no idea of blogging but I wanted to share my journey with stamps and ink, hence why I called this blog “a stamping journey”. So THANK YOU for sharing in my journey. I hope I have inspired you along the way. I look forward to sharing many more projects with you in the future. DAISY PUNCH AND OTHER NEWS! I am interrupting our regular inspirational postings for a commercial break. There are some important updates that I must share with you. FIRSTLY and most excitedly, The Daisy Punch is now available. This punch has exceeded Stampin’ Up!’s expectations resulting it being on back order – twice. Now it is back! You can grab that in my store now HERE. Only 2 days left to grab your coupons. Every $90 order you receive a $9 rebate voucher to redeem in August. That’s a great saving. Grab your last minute orders now. 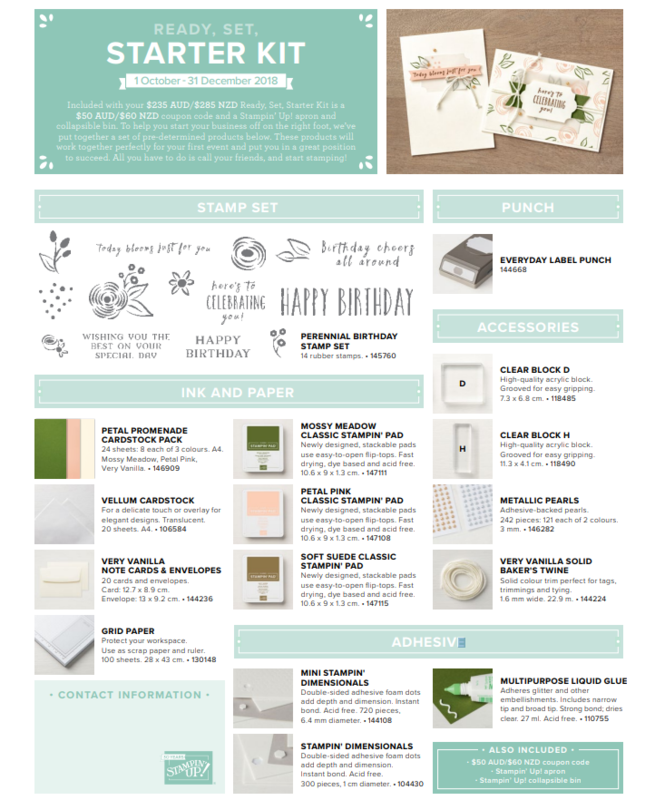 After you place your order you will receive an email from Stampin’ Up! with a code. Don’t lose this email. This code you will add to redeem your savings next month. But do you want even more value? Why not $187 extra – Free!! 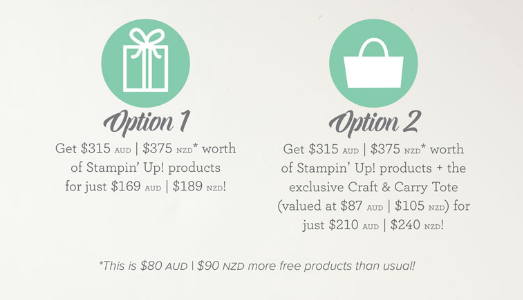 It’s already great value when you join Stampin’ Up!- but It’s Christmas in July and you get extra gifts. If you are not convinced. If you think you are going to sign up for something and never get out of it. If you think you have to do parties and classes and sell big time then take a minute to read my page HERE. 10 Reasons why you need to be a part of the Stampin’ Up! family. You can join directly at my website now HERE and I will help you along the way. Whether you plan to do classes – and it’s ok if you don’t or enjoy the discount. Or enjoy the great value now and move on. It’s all part of your exciting journey with Stampin’ Up! and I would love to share in it with you, wherever you are in Australia. I look forward to welcoming you.